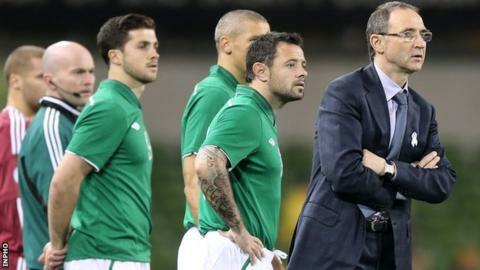 Martin O'Neill savoured "an exhilarating evening" as his first game as Republic of Ireland manager ended in a 3-0 friendly win over Latvia. Robbie Keane, Aiden McGeady and Shane Long were the scorers in a comfortable victory at the Aviva Stadium. "I was delighted with the performance, but there will be sterner tests ahead," said an encouraged O'Neill. "We played some lovely football and the crowd were terrific. It was an exhilarating evening for us." O'Neill had special praise for Wigan winger James McClean, who played under him at Sunderland. "He was given the man of the match award and I would not disagree with that - he was fantastic," added O'Neill. "But there were other performances too. We could have scored a few more but overall I am delighted with the team." Defender John O'Shea said the new managerial duo of O'Neill and Roy Keane had made a positive impact on the squad this week. "They are two natural winners and want the game played the right way," said the Sunderland man, who also played under O'Neill for the English Premier League club. "They know when we have to work hard and press teams and play when we have to." On the match, O'Shea added: "We needed a clean sheet and a couple of goals and thankfully we did that. "There were plenty of pleasing points and I look forward to a tough game in Poland."